The educational attainments of Beijing’s permanent ethnic minority population out perform or are on par with the dominant, local Hans. Yet, the Han demographic disproportionately dominates the high-wage, education-intensive employment sectors. What accounts for this paradox? What does this signify regarding the management of ethnic difference in the capital city? And how do we improve this situation? Drawing upon recent research, this paper will offer sociological explanations to answer these questions. Moreover, it will further suggest strategies for enhancing the development of ethnic minorities in Beijing. 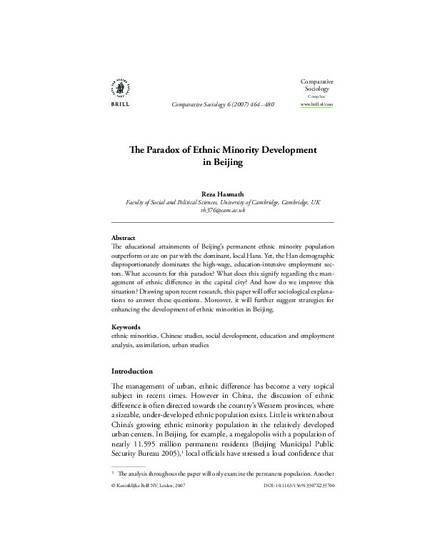 Hasmath, R. (2007) “The Paradox of Ethnic Minority Development in Beijing”, Comparative Sociology 6(4): 464-480.